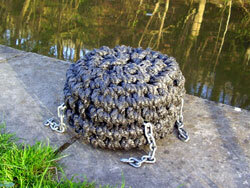 We produce a wide range of rope fenders suitable for a variety of boats from traditional narrowboat, to Dutch barges, canal or river cruisers, wide beam and everything in between. Our fenders are produced to traditional techniques using either natural or synthetic materials to suit. We stock a large number of fender types to suit most designs of boat, but as not all boats are alike we also offer a bespoke service and can make to order. Please feel free to contact us with your requirements. All our fenders are built around a solid rot-proof synthetic rope core, and chains where applicable are galvanised steel securely fixed all the way through the fender. The fender is then covered in either half-hitching or crown sennet, in a choice of black rot-proof polypropylene rope or natural rot-proofed sisal rope. Your fender can be further decorated with one or more Turks head knots which as well as looking attractive, add extra durability to the fender if added at the wearing points. We also produce mooring ropes and anchor warps (chain & rope) in high-grade soft-touch polypropylene, in a variety of sizes and colours. We can also produce fancy ropework such as bell pulls / bellropes, mats and other items from time to time. These items can also be made to order, so please contact us for further information. Please have a look around and don't forget to take of look at our special offers range for any bargains or one-off items. We are also trading on ebay under the name 'ropefenders', where reduced items can be found. We have secure online ordering on this site via Paypal. We offer a complete mail order service, or alternatively contact us to see where we are on the canal network. We are happy for you to get in touch to discuss any special requirements you may have.